Fullname: Nguyen Xuan Khanh Born in 1976 in Vietnam. In his opinion, fine arts is the way connected the spiritual cosmos with realistic life. 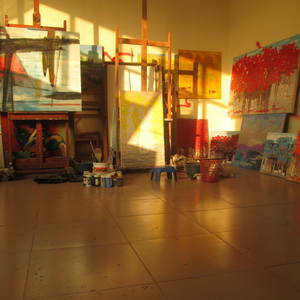 It always reflects the consiousness world of an artist on the surface of canvas via colors, shapes, lining figures, etc. His art is the picking-up of the real life with far-away dreams of a pure universe embedded in everybody's memory... With main purpose of only using a few colors, minimum concised lay-out and characters in order to express the maximum expressiveness and create one new view about realistic world. Especially, drippings will never follow our intention, so it can create the surprise effects and make more interesting in each art work, let enjoy Khanh’s painting and be immersed in feelings. 2016 Sep: Art For Your Bedroom Collection on Saatchi Art's homepage. 2016 May:New This Week 5-23-2016 Collection. 2015 December: To be featured in the New This Week 12-28-2015 Collection on Saatchi Art's homepage. 2014 Feb.: "Autumn" painting was collected to hang in Saatchi office in L.A! 2013: Be favourite by www.paulittleman.com (Paul Ittleman Realty LLC), Florida, U.S.A. Paintings have been exhibited in O.P Palace, Bangkok, Thailand. April/2008: Be introduced in “Dress my Nest” of Style Network, PB & J Television, Santa Monica, California, America. There are many paintings in the individual collections in foreign countries like: America, Japan, Thailand, U.K., France, Spain, U.E.A., Italy, New Zealand, Switzerland, etc. 2014 Sep.: Exhibition of “CONTEMPORARY PAINTING” – Brick Lane Gallery, 96 Brick Lane, London, UK. 2012: Exhibition of “The days...” of Fine Arts Education Department - Hanoi University of Fine Arts. 2006-2010: Anual fine art exhibitions of Hanoi University of Fine Arts. 2007: Exhibition of Red river Fine Arts Award, Hanoi. 2002 Jan.: Exhibition of "Hello Spring" (Second prize), Hanoi. 2002 Oct.: Group exhibition of "Vietnam, My Country", Hanoi. 1999-2002: Anual Fine Arts exhibitions of Central College of Music and Fine Arts, Hanoi.